Keep Rover (and Kitty) healthy for 2013! GO! 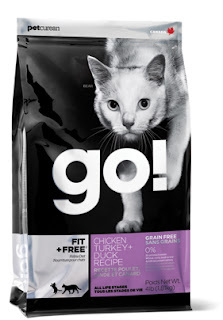 recipes are nutrient dense and energy-packed to provide a true fitness food for pets on the go and those with unique dietary needs. They help revitalize a pet's energy, or help to meet the needs of pets with food allergies and sensitivities. They contain no growth hormones, by-product meals or artificial preservatives. So that means this year your pets can stick to their New Year's resolution to be fit and healthy too! 1. GO! FIT + FREE™ grain free recipes meet the needs of active cats and dogs. Nutrient dense and featuring meat proteins as the first six ingredients, these recipes provide a true fitness food for the puppy, adult and senior life-stages of dogs and for all life-stages of cats. 2. GO! REFRESH + RENEW™ recipes help revitalize a pet's energy. These whole-grain all life-stage recipes are nutrient-dense and designed to refresh and revitalize a pet's energy needs. 3. GO! SENSITIVITY + SHINE™ recipes meet the needs of food allergies and sensitivities. These recipes are great for all pets and are specifically formulated for dogs and cats with food allergies and sensitivities.